A train derailment in Northwest Spain put a damper on the holiday festivals of a nearby town in Spain. The express train killed 77 people and injured more than 100 compartment passengers on the train’s route. “At least 73 people died at the scene, and four others died while hospitalized,” said Maria Pardo Rios, a spokeswoman for the Galicia regional Supreme Court. Deaths that occur outside of hospitals are record by court judges in Spain. “More than 20 victims remained in critical condition,” said Agustin Hernandez of the Galicia infrastructure ministry. The train carried a total of 218 passengers and was at the end of a six-hour route from Madrid to the town of Ferrol. The accident occurred at 8:41pm Wednesday; rescue crews were on hand immediately after the incident helping survivors. Observers said the train was engulfed in flames and survivors were pulled through broken windows to safety. “It was unclear how fast the train was traveling when it crashed. It was capable of going up to 250 kilometers per hour (155mph),” said Julio Hermida, spokesman for the state railway. “On high speed lines, the European Train Control System should automatically correct the speed of the train, but this accident may have happened on a stretch of line which is not designated as high speed,” said Transport expert and author Christian Wolmar. Investigations continue to move forward to find reasons why the accident occurred. Many have speculated speed could be the overriding cause. The driver of the train told police he had entered the bend too fast. Residents living near the area of the derailment heard a loud crash and rushed to the site for support. The train derailment put a damper on the festival of Saint James holiday in Spain for thousands of Christian pilgrims. Celebrations were due to begin in Santiago de Compostela, a popular destination for tourists. Officials canceled festivities temporarily in consideration of the tragedy. Locals assisted survivors with blankets and bottled water during rescue efforts. “There’s a huge challenge ahead, not least in identifying all those killed and informing their families. Two investigations are under way, we want to establish what happened and find out what exactly were the causes of this serious rail accident,” said Spanish Prime Minister Mariano Rajoy a former resident of the area. 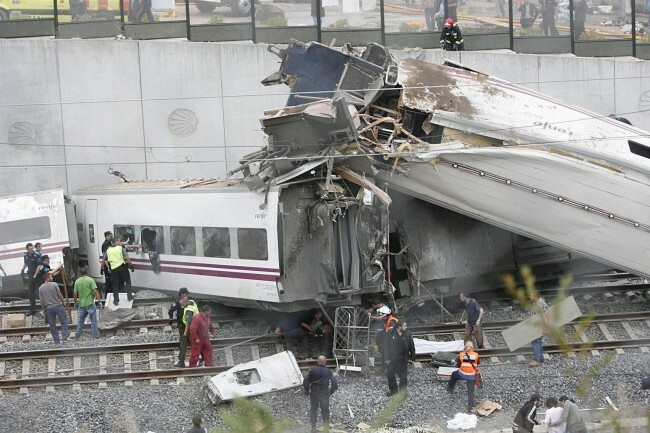 The train derailment has dampened the festive holiday spirit in Spain and investigations are in process to uncover the exact cause of the tragedy. All celebrations in regards to holiday activities have been suspended until further notifcations by officials.